Having not read any of the previous books in the Humanity’s Fire series, I came to this volume with an open mind and a willingness to be converted. 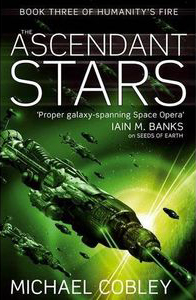 I’m a sucker for Space Opera and this has it all: galaxy-hopping adventure, stupidly destructive weaponry, evil robots, sentient AI characters, and a devil-may-care gung-ho hero in Greg Cameron who, alas, kept slipping into a somewhat irksome Scottish accent that crippled any suspension of disbelief on my part. To be fair, the author makes an effort to introduce new readers by providing a helpful summation of what has gone before in each of the previous books, coupled with an introduction to the main characters, as well as lists of the main sentient species and civilisations (sic) thereof, followed by a 9-page prologue. All being well, the story finally gets underway and it doesn’t take long before things are put in motion and the ride begins. Along the way we are introduced to some memorable characters (and deaths) and what I can only assume is the author’s take on some serious virtual reality/cyberspace tripping – all of which is generally very well crafted and inexorably does indeed lead to an emphatic and explosive finale. Despite everything, and believe me ’tis a rocky roller-coaster indeed, I did actually quite enjoy this, although I’m not sure how telling it is that my favourite parts and characters were mainly those from a virtual/AI perspective. These were especially evocative, and in particular I enjoyed the quirkiness of Reski Amantes (a kind of shape-changing robot) among a full cast of sentient/virtual AIs â€“ Julia Bryce’s virtual adventures with Harry were also all stand-out chapters for me, for example. In conclusion? I’m not going to be racing out for earlier volumes, but am definitely pleased to have shared part of the journey. A worthy effort, but probably an acquired taste as well.